At dawn fifty years ago today, Jose Isaias Constante Laureano was shot in Saltillo, Coahuila for murder — the last application of capital punishment in Mexican history. Though only formally abolished in 2005, capital punishment in Mexico simply dwindled away in the middle part of the century. The last civilian execution was all the way back in 1937. Mexico’s closest engagement with the death penalty these days has been protesting the dozens of cases of Mexican nationals condemned in the United States after being denied Vienna Convention rights of consular access. Since past performance is no guarantee of future returns, nowhere is it written that the next five decades will also remain death penalty-free in Mexico. In fact, given the country’s wave of destructive drug war crimes, calls to restore the ultimate sanction have been heard from Coahuila’s own governor as well as from such unexpected quarters as Mexico’s Green Party. 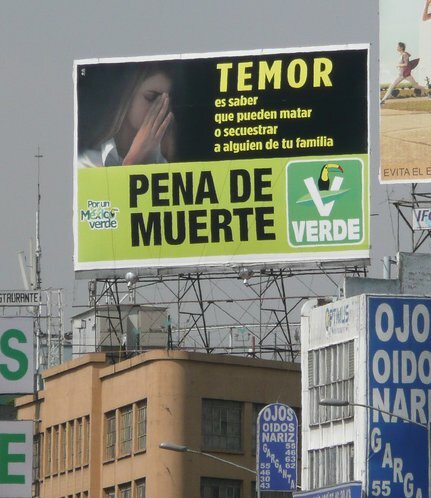 Green Party pro-death penalty billboard in Mexico. (cc) image from Randal Sheppard.